Evergreen Vineyards owned and farmed 150 acres of grapes, some directly in front of the Evergreen Aviation and Space Museum, near McMinnville, Oregon. The Evergreen Museum houses the famed “Howard Hughes Spruce Goose” plane, along with many other historic aircraft, as well as the now closed Evergreen wine tasting room. A space and missile museum and large IMAX theater are also located nearby. 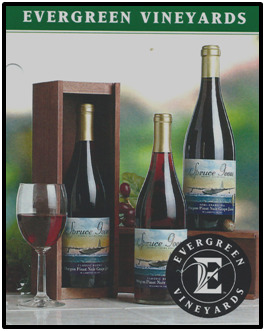 Evergreen Vineyards’ parent company was Evergreen Aviation which ceased all operations including operating the vineyards and winery in 2014. The various museums continue to operate.